I have just bought home an African Grey called Sammi, I have only just bought him home this weekend. He is gorgeous, three years old in December. The owner sold him because she is having to work full time and knows it would be unfair to leave him alone all the time. She did say he preferred women and we have really bonded and fallen in love (well I have to be sure) he comes to me I say head down and he loves me tickling him, he drinks from my cup, chats away etc. He, unfortunately, dosnt seem to like anyone else is this normal? can anyone give me some advice? I have two dogs and a cat but luckily he was bought up with two staffs (same breed as mine). I have been recommended this site by a friend and look forward to having a good read. Hi there! Welcome to the forum sounds like you are well owned by your grey already!!! We'd love to see some pics!! I can't help but I'm sure someone will be along soon with some good advice!! Hi Sue, welcome to the forum, glad you've joined us. Love greys, they're amazing, I have three, two congo greys and a timneh. I don't think it's unusual for any birdie to take one particular person to love the most. Possibly in Sammi's case you spend the most time with him and pay him the most attention so you have made him feel safe and secure again after moving from his former home. If you have particular difficulties with Sammi's attitude towards different people and you describe the incidents to us, people here have the experience to work through things with you to try to help Sammi integrate into your household. Love staffy's by the way, they have such gentle natures. A little girl named Steffi Staffi visits here very often and all the birdies love her. We will all look forward to hearing all about Sammi and seeing loads of photos, have a wonderfully magical life together. Welcome to the forum. Your new arrival sounds like he has settled in very well. All of ours birds prefer one or the other of us so it is normal. Sammi sound slots of fun! Pleased you found us. I told you everyone was friendly!! Oh he's lovely Sue, dear little chap. What type of foods does he like? is he good at eating fruit & veg yet? We need more photo's of Sammi please! Di T wrote: Oh he's lovely Sue, dear little chap. Confusing this forum....!!! honestly it's easy to use, just click onto Reply on the bit you want to reply to. Show Sammi how to do it!! has put up a post asking what folks birds eat, so you can find your way to there easily. 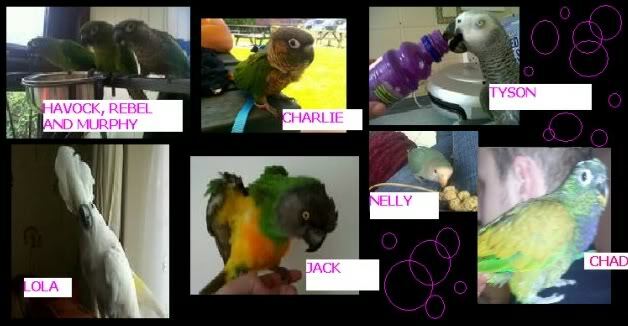 Mine have Tidy Mix, they prefer that as well as fruit & veg daily. hi Sue and welcome, i'm a newbie too!! Di T wrote: Confusing this forum....!!! honestly it's easy to use, just click onto Reply on the bit you want to reply to. Show Sammi how to do it!! Don't forget to go over to Photo of the Month competition and vote, you have 2 votes and I expect today may be the last day to cast them.